Before the big race, my teammates and I huddled together, stacked our hands and cheered like the pumped-up teenagers we were. Twenty-five years later, I still hear the echoes. 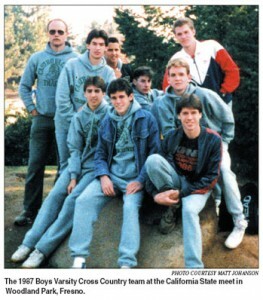 Castro Valley High’s cross country team had an eight-year championship streak on the line in 1985, providing us abundant motivation and what felt like unbearable pressure to win our league meet. Though we ran our hearts out that fall day, rival San Leandro beat us by three points. The loss crushed me as a 15 year old. Yet my teammates and I certainly grew because of it, even if it took me many years to see it that way. As a teenager I did well in class and took part in many extra activities but there’s no question that distance running taught me best how to work hard in the pursuit of self-improvement. From then on we gave sweat and blood. Our dedicated and underpaid coaches led us on runs after school, on weekends and throughout the summers, sometimes twice a day. Hard as it was, we had the time of our lives, improving every year, winning five track and cross country championships and reaching the state meet. More importantly for me, I made great friends and healthy fitness habits which I expect to last a lifetime. That’s why the most recent wave of budget cuts breaks my heart even more than previous ones. Facing a $5.1 million deficit, Castro Valley’s school board just voted to eliminate all financial support for athletics in 2010-2011, joining scores of other districts forced to make painful cuts. There’s hope our program can survive on donations and fundraising but certainly no guarantee. I don’t fault schools for sacrificing sports when they can’t even support classrooms properly. I don’t even blame lawmakers or the governor, whose hands are tied by voter-approved constraints like Prop. 13. But I do know that we’re going to pay a price for our collective failure to offer this generation the same opportunities that benefitted previous ones. As a teacher at my alma mater, I’ve seen countless teens gain maturity and discipline through their involvement in athletics. Sports provide some students who are barely hanging on with the extra motivation they need to keep up in class. Take away their favorite part of school and many will stop trying or simply drop out. If we can’t somehow scrape together the money to reasonably support education and by extension school athletics, kids won’t just experience a character-building defeat that will help them work harder in the future. Instead, they’ll suffer indefinitely from missing opportunity and their own unfulfilled potential, and they’ll have every reason to conclude that an uncaring community has quit on them. Their elders need to come together and work hard as a team to prevent a loss that will teach youth all the wrong lessons. If we care enough, we’ll find a way to let them win, lose, grow and cheer.